Earlier in 2015, Roger Federer defeated Novak Djokovic in straight sets using ultra aggressive tactics for a 7th title at the Dubai Duty Free Tennis Championships. Sunday afternoon in Mason, Ohio, the Swiss maestro repeated the storyline, this time defeating Djokovic for a 7th Cincinnati Masters crown. Coming into today’s final, the two superstars were even in their head-to-head record for the first time ever, 20-20. Federer claimed his 24th ATP World Tour Masters 1000 title and 87th career title with an impressive 7-6 (1) 6-3 win over the top seeded Djokovic. 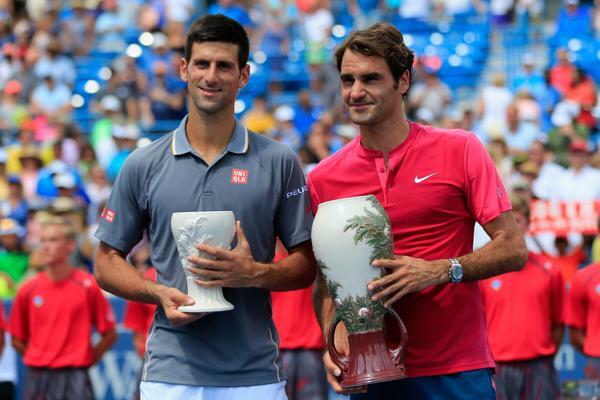 It was the third final in Cincinnati between the two, with the Swiss prevailing in both previous meetings (2009, 2012). The coined phrase “pulling a Roger” saw the Swiss rushing in on a return in the first set tiebreak that put Djokovic under pressure to put a backhand into play. Federer’s attacking style kept him in front from then on, breaking easily and taking a 3-0 lead in the second set. Against the best returner in the game today, 7-time Cincinnati champion won 83% of points on his first serve and 73% of points on his second serve. He did not drop serve once against Murray or Djokovic, and did not face a single break point either. With 32 winners and winning 21 of 29 points at net, Federer prevented Djokovic from finding any rhythm from the baseline. ATP World Tour Hot Shot. Federer Twin Daughters Cincinnati Celebration. Sky Sports on court interview. Post-match ATP World Tour interview. Watch full coverage of the 2015 US Open, beginning Monday, August 31, on FedFanTV.